OAKLAND, CALIFORNIA — The International Interior Design Association of Northern California has announced the winners of the 2018 Honor Awards. 2018 Honor Award winning workplace projects are outlined below encompassing the categories Work: Small, Work: Medium, Work: Large, Give, and People’s Choice. Congratulations to the winning clients and firms! "General Catalyst wanted their new San Francisco location to be a home base that was part workshop and part event space. Our design studio worked with them to make that happen. Transforming a historic space that had originally been a manufacturing building and then a department store, the new office is tailored to their needs with unique features like an incubator space where early stage companies can work side-by-side with General Catalyst investors." "One of the key challenges was designing a space that felt open and boundary-less while also meeting the high-level security obligations. The design team created an office plan that fosters unrestricted circulation, balanced with visually distinct spaces that separate social functions from high-security work areas." "The new NVIDIA headquarters is a campus in one building. With only two work floors, connection between these floors is enhanced by a variety of oversized staircases that also can be used as places for spontaneous interaction and exchange of information. The central core of the building—its “heart”—is where all amenities, conference rooms, and restrooms are clustered, drawing together all the building’s inhabitants multiple times each day." 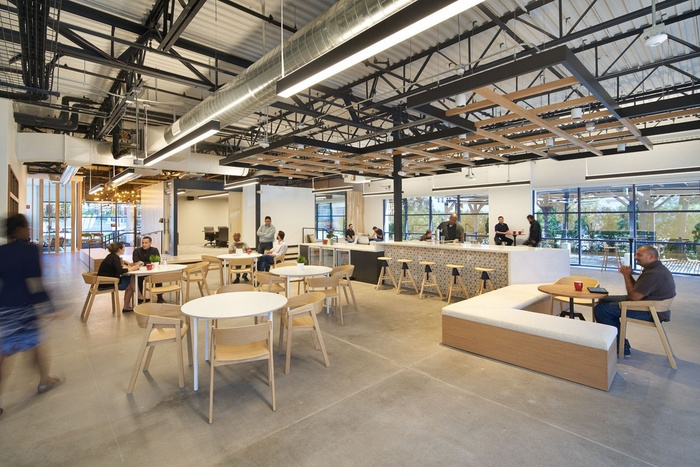 "The Kapor Center commissioned Fougeron Architecture to transform an existing 1920s-era office building in downtown Oakland into an innovative workspace. The Kapor Center for Social Impact works to improve access to opportunity, participation and influence in the United States for historically underrepresented communities through investments in information technology and partnerships with nonprofits." "The headquarters for Medallia was designed to reflect the ethos of their people and products: an engaging, user-centric business that helps companies better understand their customers and improve their experiences. Their workspace showcases the innovations that can be achieved through close collaboration between design and construction, using an architect-led, design-build method. "